When I am explaining this in class I sometimes find it difficult to distinguish between 1 and 2 but Samdahl's research (1988) unpacks the two and proved Neulinger's hypothesis among a Western population. Samdahl (1988) had subjects carry a beeper which beeps at random times, at which subjects were required to record the extent to which they regarded their current behaviour to be leisure. It was found that it is only in when they rated their behaviour as being "expressing their true selves" and "independent of the expectations of others," that they judged their behaviour to be leisure, and conversely when their where not expressing their true selves (!?) and behaving according to the expectations of other people that they judged their behaviour to be negative leisure or onerous. Bearing in mind cross cultural work on motivation (Iyengar & Lepper, 1999) and control (Morling, 2000) it could be predicted that at least the latter condition that the perception of leisure content of activities be free of the expectations of others, may even be reversed in a Japanese sample. Doing things purely for "self-satisfaction" (jikomanzoku, jikoman) is perceived as being rather drear or egotistical, like staring at ones navel, whereas activities which make others happy are often, in the popular Japanese Zeitgeist at least, described as being fulfilling. It would therefore be interesting to carry out the same experiment on Japanese subjects. In this days of smart-phones with email, I could use a service like Boomerang, LetterMeLater, or Deferred Sender to send subjects an email at a random time and have them rate their behaviours according to Samdahl' criteria. Hypothesis, to the Japanese happiness (shiawase) is experienced when what one is doing (shi) matches (awase) the doings and expectations of others. 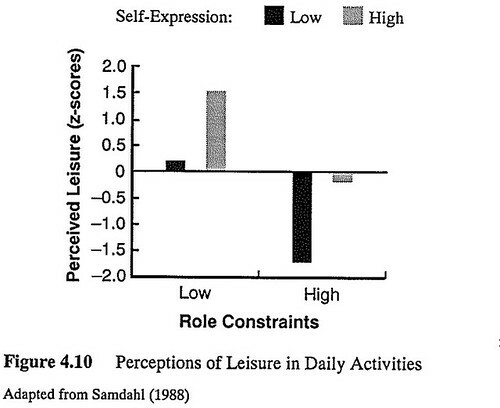 In other words, the high Jleisure condition may be the right most bar in the above graph. Morling, B. (2000). ‘Taking’ an Aerobics Class in the US and ‘Entering’ an Aerobics Class in Japan: Primary and Secondary Control in a Fitness Context. Asian Journal of Social Psychology, 3(1), 73–85. Neulinger, J. (1981). To Leisure: An Introduction. Allyn & Bacon Boston, MA.